This is a truly communal effort. Moses tells the people what is needed in terms of materials and the people respond so overwhelmingly that he has to tell them to stop (a fundraiser’s “happily ever after”). Led by Bezalel and his assistant Oholiab, many, many men and women, “wise-hearted” artisans, contribute their skills in making linen cloth, metal working, wood carving, making planks of acacia wood, weaving goat hair, spinning and dyeing yarn, embroidering, dyeing animal skins, making and hanging curtains, stone cutting, and so on. Their skills are considered gifts from the Lord. 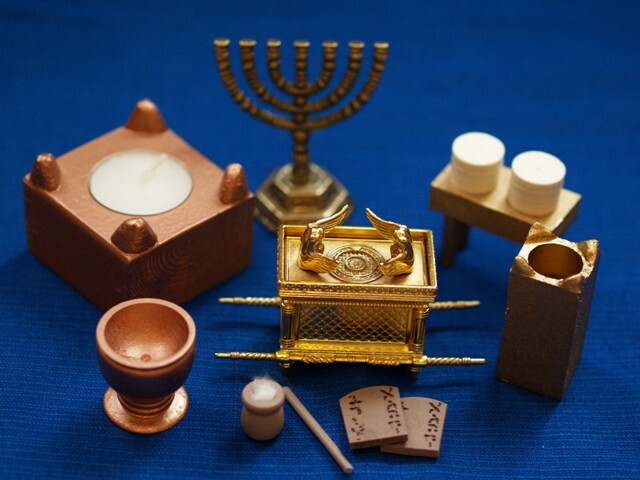 Bezalel himself makes the ark, cherubim, table and utensils for libations, lampstand and lamp, copper laver, altar and utensils for burnt offerings, incense altar and the sacred anointing oil and the incense. However, when Moses first assembles the people, before he even tells them about the Tabernacle project, he reminds them (35:2-3), “On six days work may be done, but on the seventh day you shall have a Sabbath of complete rest, holy to the Lord; whoever does any work on it shall be put to death. You shall kindle no fire throughout your settlements on the Sabbath day.” The placement of these verses in the text led the rabbis to conclude that observing the Sabbath is more important even than building the Temple and, further, that the tasks needed to build and furnish the Tabernacle provide a guide as to what tasks should not be performed on the Sabbath. You can learn about the 39 categories of labor (melachot) they defined at http://www.chabad.org/library/article_cdo/aid/102032/jewish/The-39-Melachot.htm. Arizona. Several states, including Arizona, tax ice blocks and ice cubes differently. Since ice cubes are used in mixed drinks, and considered food, they aren’t taxed by the state. Ice blocks, however, are subject to sales tax. Colorado. Think twice before taking a full cup to go while driving down a bumpy road in Colorado. Cups aren’t taxed, but lids and straws are. Other nonessentials, such as toothpicks, portion dividers, cup sleeves, and bibs are taxed as well. Illinois. Pity the poor candy store owner. In Illinois, Twix bars aren’t taxed because they are made with flour, so they don’t meet the state’s definition of candy. Other Mars candy bars such as Snickers, though, are taxed, because they contain no flour. Similar laws are on the books in Washington, Colorado, and Connecticut. Missouri. To encourage young men to marry, Missouri charges an annual tax of $1 to single men between the age of 21 and 50. The law was passed in 1820, when $1 was equivalent to about $20 today. New York. Looking forward to a delicious New York bagel? Those who want it prepared — toasted, sliced, covered with cream cheese, or altered in any way — have to pay the 8.875 percent tax that is applied to processed foods. An unsliced bagel to go, however, isn’t taxed. Washington, D.C. The nation’s capital apparently has mixed feelings when it comes to healthy habits. Both gyms and sugary drinks draw a 5.75 percent tax. “A check,” replied the guide. This entry was posted in Uncategorized and tagged artistry, Bezalel, construction, donations, fundraising, half-shekel, Moses, Oholiab, Sabbath, Shabbat Shekalim, tabernacle, tax. Bookmark the permalink.